Today the Senate voted to confirm Scott Pruitt as the head of the Environmental Protection Agency. Pruitt is, to put it mildly, no fan of the organization that he now heads. He has filed a number of lawsuits against it in his capacity as Oklahoma’s attorney general and criticized it in public statements. 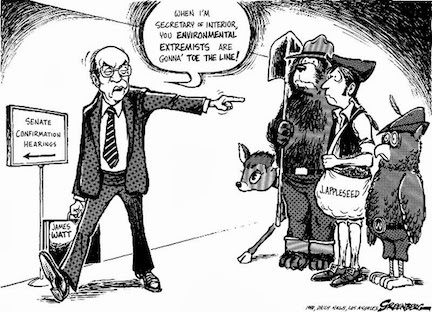 For environmentalists, this is a nightmare: a fox is now guarding the henhouse. For many Republicans and fans of Donald Trump, however, it is a time to rejoice. Trump himself has declared his intention to “get rid” of EPA because he believes it champions business-killing regulations and because it promotes the “bad science” of climate change. He has support for these views in Congress; a House bill recently introduced by freshman representative Matt Gaetz (R – Florida) promises, in a mere ten words, to “terminate” the agency by the end of 2018. The big irony here is that the EPA was actually the brainchild of the Republican Party and of Richard Nixon in particular, who signed it into existence in 1970. Even if Nixon was no environmentalist himself, he was savvy enough to recognize that many Americans were, including a number of his own White House staff. Under his aegis Congress passed some of the most important federal environmental legislation of our time, such as the Clean Air Act of 1970, the Endangered Species Act of 1973, and the National Environmental Protection Act of 1969, which mandated environmental impact statements for federally funded projects. In that same era, Pennsylvania Republican John Saylor was arguably the House of Representative’s single biggest champion of national parks and wilderness and its most vociferous opponent of river-killing federal dam projects. Indeed, from the administration of Teddy Roosevelt, with its Progressive conservationist emphasis on forest management and national park lands, to the days of Nixon and Saylor, the environmental movement in America has been closely associated with the GOP. In some ways, it has been even more closely associated with the Republicans than with the Democrats. But by the 1980s this had changed, a result of the antiregulatory, small-government sentiments of a GOP tacking hard to the right. In 1981, Ronald Reagan took up the anti-environmental call. As a part of his larger war on federal regulations and bureaucracy, Reagan intended to cut most of the federal environmental regulatory apparatus, from the top on down. He installed dedicated anti-environmentalist James G. Watt as Secretary of the Interior and head hatchet-man. As EPA administrator, Reagan chose Anne Gorsuch Burford (mother of Neil Gorsuch, Donald Trump’s current nominee for Antonin Scalia’s Supreme Court seat). Both were tasked with reigning in the alleged excesses of their own agencies, and both pursued that goal with a vigor that made their enemies blanch. 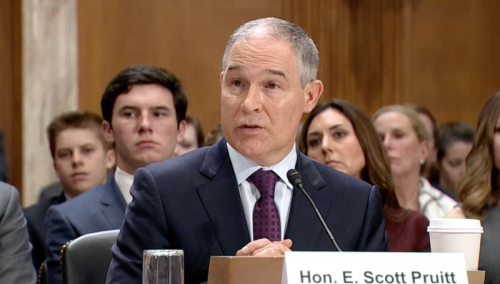 Foreshadowing Scott Pruitt’s likely strategies, Gorsuch cut the EPA’s budget and staff and relaxed enforcement of regulations, while Watt encouraged privatizing some federal lands and opening others to resource extraction. Reagan discovered the hard way that Americans felt much more positively about federal environmental regulations and management than he and his conservative fellow travelers did. The backlash against Watt’s and Burford’s policies was fierce. Groups like the Sierra Club enjoyed strong surges in membership and organizational fervor. Within two years, both Watt and Gorsuch were out and Reagan dialed down his assaults, and never attacked the EPA again with the same vigor. Part of a sign from the Democratic Congressional Campaign Committee urging protest against EPA cuts. Trump and Company may experience the same phenomenon. 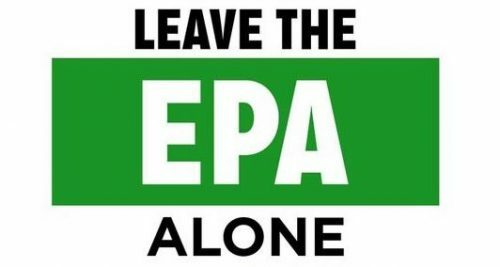 History suggests that attempts to dismantle the EPA have serious political repercussions. The American public, Republican or Democrat, has long demanded a clean, healthy, and protected environment. It is likely that a majority will not stand for any attacks on those protections and will respond much as they did under Reagan: with their votes and with vigorous environmental activism. Trump and the Republicans have shown no fear of the political third rail thus far, however. And they rarely reflect on the GOP’s longer history with movements like civil rights and environmentalism. If they choose to proceed with the destruction of the EPA, though, they will betray their own legacy and perhaps, undermine their chances for reelection. Brian Allen Drake is Senior Lecturer in the University of Georgia’s department of history. He is the author of Loving Nature, Fearing the State: Environmentalism and Antigovernment Politics Before Reagan (Seattle: University of Washington Press, 2013).